After my post last week about the Blue Castle and its history as a cable car barn, it seems only appropriate to look at the other large structure built to take care of DC mass transit: The East Capitol Car Barn. As mentioned last week, cable cars – which had themselves supplanted horsedrawn public transport – were soon overtaken by technology in the form of electrical-powered vehicles, to whit, street cars. Six electric cars were started yesterday on the F street line, displacing the same number of horse cars. 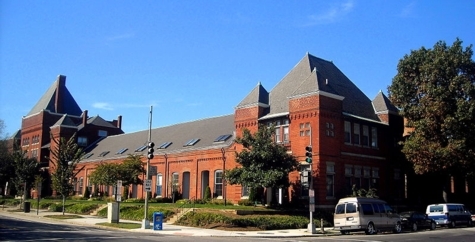 […] This line extends from 15th Street northeast, down East Capitol street [then] by way of F street, Connecticut avenue, and P street to Thirty-sixth street and Prospect avenue in Georgetown, where the new car barn is situated. The system proved itself quite useful, though shoes that picked up the electricity below street level were prone to fouling with snow and ice during the winter, and the slots in which they traveled would squeeze shut in the heat of the summer. The streetcars did not just transport people, however. In 1903, the Post reported that tests had been made in adding a special mailbox to the side of the cars, allowing people to drop letters into them as the street car went by. The new mailboxes were shown off at the car barn, but there is no indication that these mailboxes ever were widely used. More worrisome was a 1908 article in which the antics of a “Lincoln Park Gang” were described. According to the article, they would wait until the street car slowed down while turning the corner of Lincoln Park, hop on board, lock the conductor in the rear trailer, and then beat up the motorman when he went to help the conductor. What the youths were after is not mentioned in the article; it seems they were just enjoying terrorizing the crowd of people heading home from the theater by street car. In another event seven years later, it was quite clear what the gang was after: money. At 3:45 AM on February 15, 1915, two men broke into the car barn and stole $2,000 in two canvas bags and disappeared into the night. Later that year, a group of students from Eastern High were on the banks of the Anacostia River, looking for snakes, when they came upon two coffee cans filled with “currency, coin, and street car tickets.” The assumption of the police officer to whom they turned over the loot was that this was from the car barn robbery. Over the next 50 years, the car barn continued to be used until 1961 for the street cars, thereafter as a bus storage shed after DC public transportation switched to this mode. In 1966, a new bus station was built on Bladensburg Rd. NE, and the car barn was finally taken out of service. For almost 40 years, the brick building stood empty, before being converted into condos, which were sold in 2005. Today, they remain a desired address on the Hill. Interesting story — love the moving mailboxes! I do think you’re missing a part, however. The current condo complex was actually built earlier, maybe during the 1980s, but the timing was bad — another recession kept them from selling, and so they became rental units for many years. Only more recently were they re-established as condos.